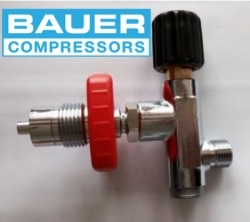 The filling device comprises a flexible "UNIMAM" high-pressure filling hose and filling valve complete with final pressure gauge. The final pressure gauge makes it easy to read off the filling pressure. It is protected against damage by a durable rubber jacket.